Since 1929, the Italian company Fope have been pioneers in the world of fine jewellery. World-renowned for the beautiful craftsmanship and attention to detail given to each piece, as well as the contemporary aesthetics and styles that characterise them, Fope jewellery is a result of experience, technique and innovation. Some of the brand’s most famous pieces are its stunning bracelets, featuring the jeweller’s famously delicate and intricate mesh designs. A statement of quality and elegance, Fope bracelets are perfect for the modern woman who wishes to complement her wardrobe with timeless elegance and sophistication. Both tradition and innovation are very important to Fope. Its heritage dates back to 1929, when Umberto Cazzola opened his first goldsmith’s workshop. Once his son, Odino, took over, the brand specialised in making watchstraps from gold and other metals and became suppliers to some of Switzerland’s biggest watchmaking brands. When the third generation joined the family business, Fope began a new venture: creating its own jewellery collections. Through this creative endeavour, Novecento mesh was born and gradually developed into a striking range of designs, becoming the brand’s signature in Italy and around the world. When the fourth generation joined Fope, the brand made its mark in the international jewellery market, where it stands out as a symbol of the elegance and quality of ‘Made in Italy’. With supple shapes and inimitable mesh, Fope bracelets are luxuriously delicate and well-known for their understated yet classic, style. They possess a harmonious balance of timeless design and creativity that have made them incredibly desirable by many around the world. The Sanskrit word for ‘one’, Eka has become a whole new way of wearing gold. Originally launched in 2007, this design is still the brand’s best-seller. The mesh is available in three different thicknesses and three types of gold: white, yellow and rose. 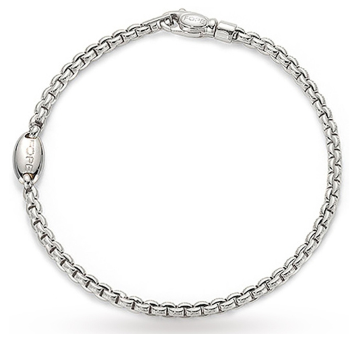 The Fope 18ct White Gold Eka bracelet, available at Banks Lyon for £775 at 0% finance, is a great example of the beautiful simplicity the brand is known for. The ‘Fope’-inscribed bead takes on an almost organic shape that reflects the design of the mesh, and the bracelet truly showcases the utmost precision and expertise that skilled Italian craftsmen put into each element. Part of the Eka collection, the Flex’It line is based on one of Fope’s inventions from the 1950s and applies the concept of flexibility to jewellery by featuring an elegant design with ‘stretch’; this ensures comfort on your wrist by also eliminating the need for clasps. The beautiful fixed rondelle bead perfectly complements the contemporary aesthetics of the bracelet, combining style, quality craftsmanship and luxury all in one. It’s not surprising, therefore, that this line became an instant global success. 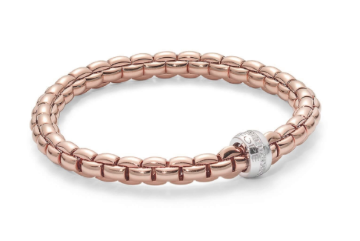 The Fope Flex’It Eka Rose Gold & Diamond bracelet can be found at Banks Lyon for £3,800 at 0% finance and offers a look that is at once playful and sophisticated. The Fope Unica collection is characterised by soft, beautifully flowing links that playfully exemplify Fope’s tradition of beauty and elegance, as well as a blended lobster claw fastener that completes its simple aesthetic. Created in Fope’s Vicenza factory in Italy by the finest craftsmen, the Unica bracelets offer a smooth, polished look that can complement any fashion statement. This Fope Unica bracelet is available at our stores for £1,320 at 0% finance and is a beautiful example of how Fope believes in crafting only the highest-quality jewellery pieces. A blend of both traditional and contemporary, this bracelet is also the perfect balance of style and comfort. 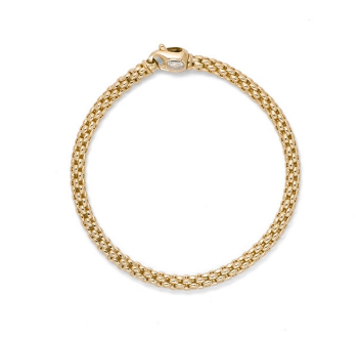 At Banks Lyon, you can discover these beautiful Fope bracelets and browse more of the brand’s charming collections. The Italian brand is the epitome of glamour and sophistication, so why not add a touch of white, yellow or rose gold to your everyday wardrobe with a Fope piece? We can also help you find the perfect Fope rings, necklaces and earrings, so please don’t hesitate to get in touch with Banks Lyon or visit us in Lancaster (01524 38 10 20) or Kendal (01539 73 03 00). Alternatively, follow us on Facebook, Twitter and Instagram.